Over the years, there have been many things I never thought I would do with climbing. When I was a gym climber, I never thought I would climb outside. Next, I swore I would never lead trad. 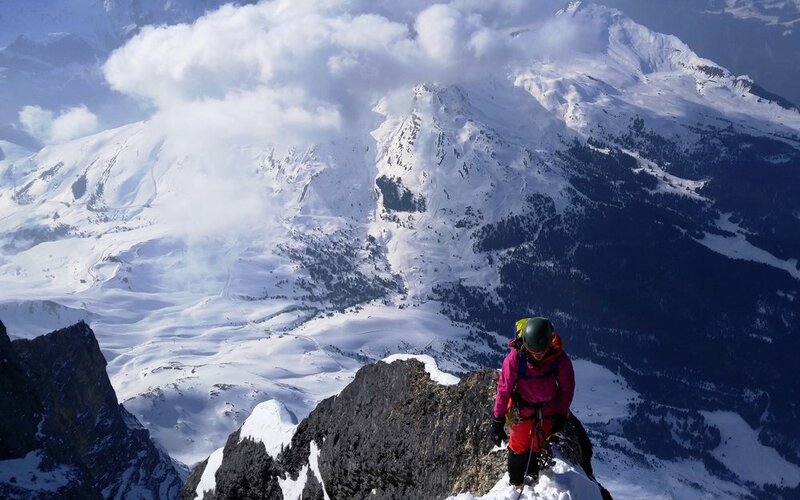 Then, I never thought I would ice climb, mixed climb, get into winter alpine climbing, and so on… Despite The Eiger Sanction being my favorite movie of all time, I never thought I would climb The Eiger. In fact, as recently as last year when I saw footage of Steck's speed ascent of The North Face, I thought about how stunning its summit ridge is but how I would never see it in person. You read things like The White Spider and the story of Kurz saying "I can do no more," then slumping over dead, swinging just feet away from rescuers in the tunnel, and just assume it's beyond your abilities. I was wrong, again. The North Face, of course! My first true winter alpine climb was The Eiger (The North Face, of course). Talk about jumping in the deep end!! Jed and I were in Europe for six weeks and the weather forecast looked unbelievably perfect one weekend. He assured me "it's really not that hard." (Ha!) It may not be a huge deal to some alpinists, but for me it was the hardest thing I have ever done. Having only done a handful of ice and mixed pitches prior, it was certainly outside my comfort zone. Although I like mixed climbing, it is still strange for me to be scraping on rocks with crampons and tools, and I am absolutely still getting used to ice climbing (and trying to NOT ice climb like a rock climber - a hard habit to break), and I continue to struggle with moving faster on snow/ice terrain. 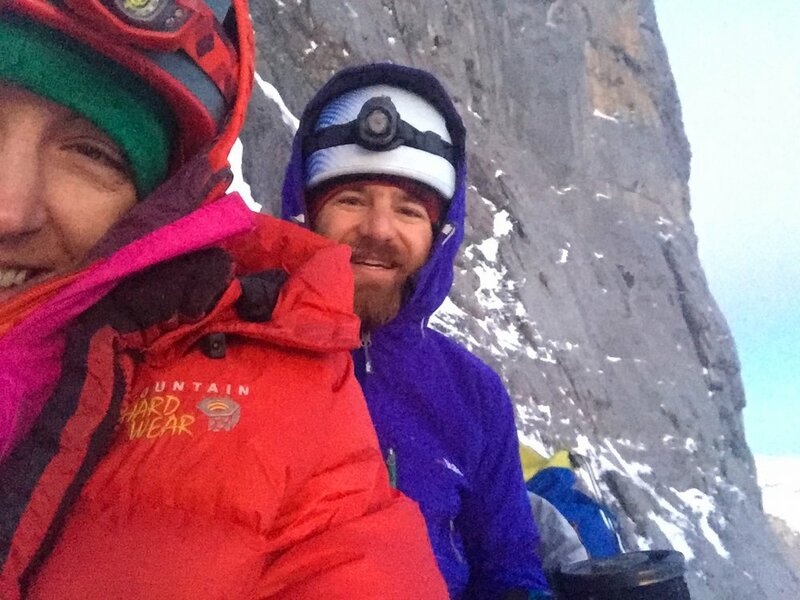 Luckily, the weather was splitter and I had an endlessly stoked, encouraging, and experienced partner (Jed had climbed the route twice before), which made for an amazing type 1 - type 2 fun adventure. Not a bad place for a bivy - Jed, my alpine lumberjack, chopping ice blocks. We got to Switzerland late Friday night and started late on the first day, having taken the train to Kleine Scheidegg Saturday morning, and opted to hike up the ski piste rather than take the train to Eigergletscher station. Because of the late start (and a headlamp that decided to randomly die despite new batteries), we didn’t have time/daylight to get to The Death Bivouac on the first day, but had to bivy above the second ice field instead. This in turn would have meant a much longer second day than anticipated. We got to the Brittle Ledges early on the second day, but knew there were no other viable bivies past that, and we also knew we wouldn't make the summit before dark. So, we decided we would have a short and relatively mellow second day and bivied at the Brittle Ledges. Luckily we had brought just enough food and fuel for three days, even though we had originally hoped for a two-day ascent. Sometimes partners know us well enough (our abilities, strengths, weaknesses) to push us just enough, to the brink of what we're capable of. There were certainly times on route where I doubted myself and wondered what the hell I'd gotten myself into. Especially the traversing – Oh, the traversing! Although the face is 1800m, the route is at least 2500m in length, due to the constant horizontal traversing required to negotiate the steep rock sections split by ledges. After every traverse I thought "Surely, this must be the last traverse!!?" 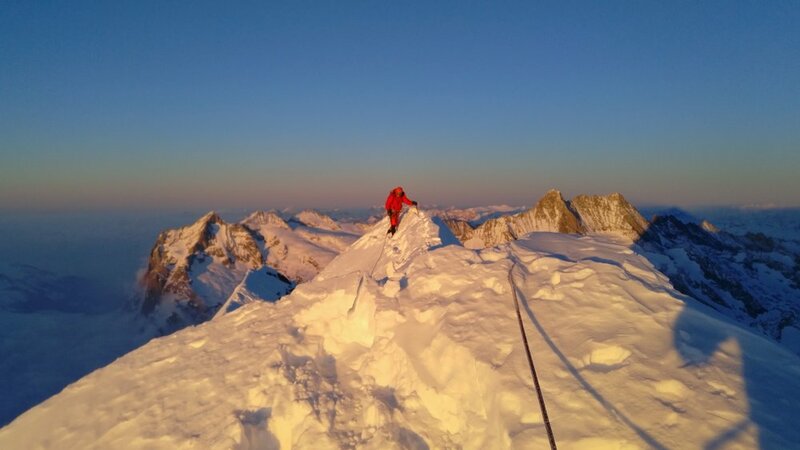 The Hinterstoisser traverse felt especially taxing for some reason, despite the fixed lines. At the top of The Difficult Crack. So for the cruxes: The Difficult Crack - surprisingly not as difficult as I thought it would be, although maybe that's because it was one of the first crux sections and I still felt relatively fresh. It was loose and steep, but eased off after about 20m. It was my fourth pitch of mixed climbing ever..
Hinterstoisser Traverse, burly as hell. The Hinterstoisser Traverse - As I already mentioned, I found this pitch to be quite hard. Burly, but also mentally taxing. Exposed blank slabs of rock, with thinly covered ice smears. I definitely didn't want to fall, and surprisingly/thankfully didn't. The Ice Hose - Very condition-dependent. Not going to lie, I don't remember this section. When I asked Jed about it, he said "It was getting dark here and that's when we found out that your headlamp wasn't working. You were climbing by feel up the 2nd icefield above." I guess that explains why I don't remember it..! The Waterfall Chimney and Ice Bulge - I had not been looking forward to this overhanging slot pitch at the top of The Ramp, but I thought the steep corner moves in the chimney were quite fun overall. The bulge was short but actually quite hard. The ice was thin and I found this to be the most technically hard climbing on the entire route. The Brittle Crack - This was the first pitch of the third day, making it feel rather stout, much more difficult than The Difficult crack in my opinion. It was steep and loose, with an ever steeper exit. The Traverse OF THE GODS. The Traverse of the Gods - probably the pitch I had been least looking forward to, as it is a steep and quite loose traverse without much in the way of protection. I was very happy to find that it wasn't as terrifying as I thought it would be, and was over before I knew it. The Quartz Crack - The final crux. Short and not as steep as some of the other cruxes. It was polished and smooth though, and still felt hard, although maybe mostly due to exhaustion at this point. Hard at the start, but then the difficulty eased off into ledges and stemming for the second half. On the phenomenal summit ridge. By the time we got to simuling the summit ice fields, I was exhausted and wanted so badly to get off front points. Although low-angle, I did find these ice fields to be hard, but again this probably is more related to how tired I was. The ice wasn't great, so I didn't feel very confident with my sticks. These simul pitches finally got us to the summit ridge, and it was everything I thought it would be - narrow, terrifying, exhilarating, gorgeous. Starting down the descent as the sun set. Jed and I now joke about The Eiger being a beginner's alpine climb, although I of course couldn't have done it without him. So, what's next? I don't know, but I now can and will confidently say that anything is possible, and to hell with thinking "I'll never do ____ " again -- aspire harder. I'm moving to Colorado next week (the pullharder migration to CO continues), starting a residency that is not only perfect for me but also close to Jed in Boulder (win, win! ), and am stoked for whatever challenges and adventures lie ahead. Jed pointing out our route, on the handy cartoon map table on the train to Kleine Scheidegg. Damn, I forgot my selfie stick and flag! We both took the same photo at the start of the day, apparently. After enjoying The Bulge. Lots of grunting involved. Finally, a few steps from the summit!